- Browse giftpax.com to find the perfect GiftPax for you and add it to the cart. - Pay using your gift card number when prompted in the checkout. -If your total exceeds the value of your gift card, you can pay the remaining balance with a major credit card or PayPal. - Upon completion of your purchase, we will mail your gift vouchers to redeem online or in store. 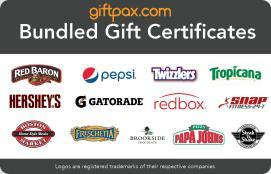 Giftpax eGift Cards are subject to the complete terms and conditions, found here http://www.giftpax.com/terms/. Your Multi-Brand eGift card will be delivered to you electronically via email within 24 hours. By purchasing, holding, and/or redeeming a Giftpax Multi-Brand e-gift card, purchaser agrees to the terms of this agreement. Giftpax Multi-Brand e-gift cards can only be redeemed at www.giftpax.com towards the purchase of e-vouchers and gift vouchers. To redeem a Multi-Brand egift card, purchaser must enter the gift card number at checkout. Other restrictions may apply. Offers subject to change without notice. Offers void where prohibited by law.